Alice Saville considers questions of reputation and legacy in an industry that’s in love with its own history. “Who lives, who dies, who tells your story?” I saw Hamilton last week, finally, and it was just as great as I expected. The refrain of the last song is still ringing through my head: “when you’re gone who keeps your flame/ Who remembers your name/ Who tells your story.” In the context of the musical, it’s a masterstroke. It’s a reminder that Alexander Hamilton died young, and unsung compared to the enduring fame of the other Founding Fathers. And if something in me rebelled against his wife Eliza’s sugary sweet storyline – not a moment of anger or ambition, just the wifely duties of raising children and keeping her husband’s flame – it’s maybe something about the way that ideas of greatness have become complicated over the past few years. The most recent step in the long, slow fall-out following Max Stafford-Clark’s departure from Out of Joint, having been accused of sexual harassment, is the news that half the company’s board have resigned: an article in The Stage suggests this was in protest against subsequent decisions taken by both the Arts Council and new artistic director Kate Wasserberg. Without knowing the full facts, it’s worth noting that the board wouldn’t be alone if they were unhappy at Stafford-Clark’s treatment. I’m not going to name and shame them here, but two recent white, male, very senior industry figures have recently used interviews to express the approximate opinion that “allegations of harassment shouldn’t be allowed to tarnish his legacy”. It’s a thought that comes up a lot. The first answer is, obviously, what about the women who never got to build legacies? The second answer is: why is legacy important at all? Aren’t ideas of legacy as harmful as they are helpful? Deciding whose stories we elevate and retell is a political act. Twentieth century theatre has its canon of names (mostly men, mostly white people) who have been judged worthy of preservation. We dedicate theatres to them and namecheck them in books: some of them remain names to conjure with, others get a little less recognition as each decade passes. Because if everyone’s vulnerable to slipping into obscurity, people who work in theatre are especially so. Unlike the Founding Fathers, they don’t generally make their way into history books. Most plays date badly, and are rarely revived (though the Finborough and Orange Tree do sterling work). The less tangible legacies of actors, directors, stage designers fare even worse. And what does remain of their work (grainy photos, sketches, or radio broadcasts) often seems quaint or strange: they succeeded by standards that aren’t ours. The cult of individual genius is both seductive (much easier to see talent as a sudden gift from the heavens then to confront the spectre of society’s vast own underused potential) and dangerous. How much do we really know about the people we decide to valorise, and who they trod on to succeed? I love history, and don’t want to retreat into some kind of soviet collectivist aesthetic, quite, but I’m more inspired by groups of people working together than single titans – not least the groups of people who are felling statues commemorating colonialists like Cecil Rhodes. I find Manchester People’s History Museum impossibly moving, and am just faintly depressed by the National Portrait Gallery’s parade of identikit royals. Theatre’s history is often told through names, but what if we celebrated whole teams, not figureheads? Processes, not products? Whole ensembles, not stars? And most of all, what if collaborative decision-making was seen as the arts industry default, rather than the ideal of a single charismatic leader? “How does #MeToo feel to you? Yes, there’s a rhetoric about “one wrong pass or incautious phrase”, but what #MeToo has really revealed is that most harassers are highly prolific offenders: people with destructive patterns of behaviour that are built into the way they operate. People that bend the world around them out of shape and to their own will, with the same forcefulness and unwillingness to compromise that’s seen as the distinct hallmark of a ‘great artist’. The legacy of #MeToo in the theatre world hasn’t been so very great. A handful of men have had their careers in theatre made (temporarily?) uncomfortable (impossible?). Quite a few men have added a few words and gestures marked “things I’m not allowed to do”. Theatres have published some guidelines. These things are all forgettable. The biggest shift has been in attitudes, not structures. And for the attitude shift to stay in place, it needs to be cemented down, to be treated with the same respect and concern we treat theatre’s heroes of bygone days. At last month’s Olivier Awards, all attendees got a nice shiny pin badge saying ‘Time’s Up’. And you didn’t have to do anything to earn it. It was swag, designed to protect attendees from the complex decision over whether or not to wear black, in support of the Time’s Up movement. Catherine Tate hosted the night, and made quite a few jokes about #TimesUp. She told a (presumably made-up) anecdote about accidentally calling a male actor “darling”, being stricken with fear that this was harassment, then touching him on the hand, compounding her embarrassment at her mock harassment. It’s the kind of joke that anyone could hypothetically make, but is overwhelmingly associated people who say things like “Oh, I’m not *allowed* to use that word anymore”, people who suggest that some kind of invisible diversity police force is perpetually on hand to prosecute the slightest breach in ‘political correctness’. Instead of the reality, a glacier-slow legal system that struggles to get any kind of convictions for sexual harassment or assault, and for racist and other hate crimes. And a theatre industry that still doesn’t have safeguards in place to protect people who speak out, especially if, or when, the current mood of openness passes. The Olivier Awards are presided over by bronze statues of Laurence Olivier (who’s far from an unproblematic figure) and exist to document theatre’s success stories. This year’s slate of awards for Hamilton proved Quentin Letts wrong (he described it as “so-so”) and that Gavin Henderson is indeed, as Lyn Gardner wrote recently, a dinosaur. It was a powerful cultural moment – a chance to add some much-needed people of colour to our line-up of theatre heroes, and to show that given the chance, audiences don’t just put up with performers of colour on stage, they embrace them in their ticket-buying hordes. But the top-line, award-winning diversity that the show has brought isn’t the same as structural changes in the industry. At my visit to Hamilton last week, the audience was almost entirely white. 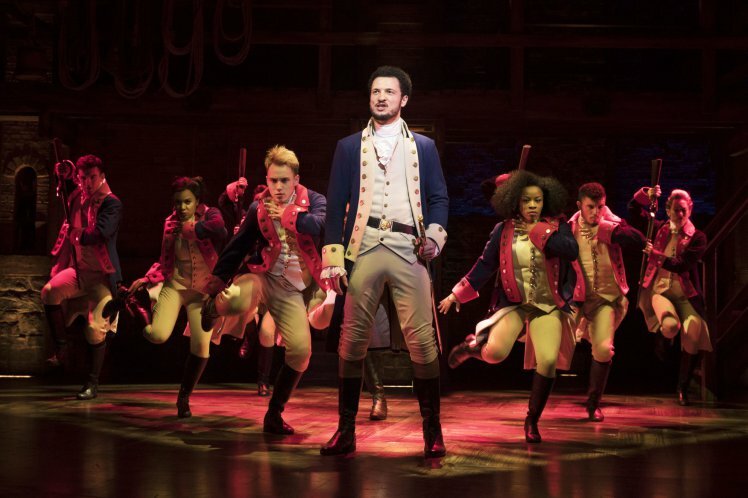 Other than the ticket lottery, which is arguably more likely to appeal to highly persistent existing musical theatre fans, the show’s London producers haven’t made any concerted effort to reach out to audiences of colour. Hamilton tells a story of blazing individual genius that succeeds against the odds. It’s a narrative that’s comforting to an establishment that’s being rocked by a steady dripfeed of studies of, and protests against, the creative industries’ deep structural inequalities – the inequalities that define who gets to become a name to conjure with. Meanwhile, the reliance on big names to sell tickets remains. And so does the ethos that ‘success’ and ‘commercial success’ are interchangeable terms, and the cultural narrative that the arts’ primary value is as an economic stimulus. And so do steep, calcified management structures, and the same older white people in charge, retaining the same ability to control the narrative. Ava Davies’ blog in response to The Writer suggests burning it all down – I guess I’m naive or optimistic enough to want the theatre industry to evolve, to break apart into something that’s democratic, collaborative, and genuinely responsive to the needs of people who work in it. The success of the past six months of openness – around sexual harassment, but also about working conditions, racism, and structural inequalities – will be defined by the way we tell the story of them. And, even more, by the way we think about success, how we create our heroes and what we expect of them. Perhaps the goal shouldn’t be to replace our problematic heroes with new ones, whose flaws are less visible. Maybe the goal should be to stop giving people so much power and influence that we treat them like heroes at all.